It was quite funny to draw this comic. Especially because it wasn't very simple to achieve the effect I wanted to create. Constantly I was trying to hard to make it better, but it shouldn't be better. So constantly I needed to pull myself back to the simple version. I even had to change some hands back to the simple ones after I scanned the whole comic in. It was funny to create and I hope you guys like the end result as well. Some of you all might have even seen the comic already. I accidentally published the comic yesterday already, because I used yesterdays date as the publishing date. But fixed it fast after that... I want to keep my archive clean and organized, you know. So, tell me... how was your weekend? i was hunting penguins! but all i got was a net full of money and someones glasses… ? This one Mojo strip is great! It reminds me of another comic that’s just like this… no borders, no backgrounds and weird funky word balloons. 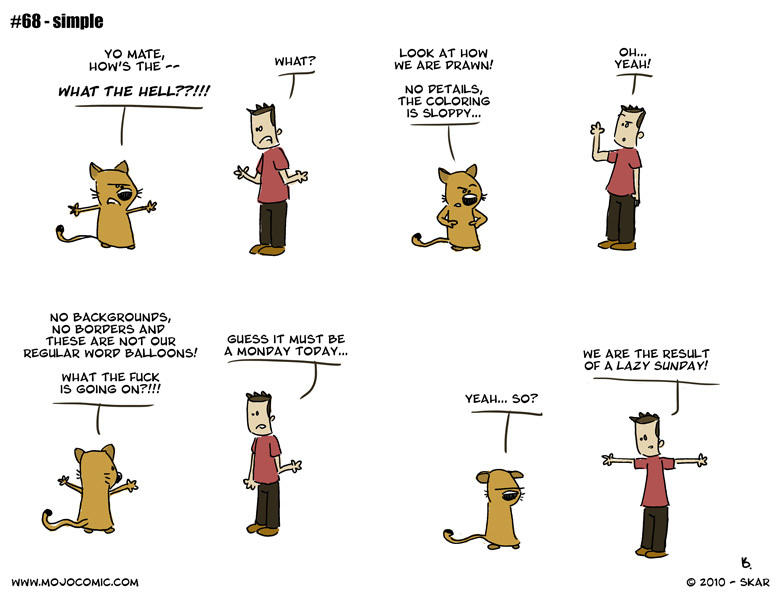 Hmmm, can’t think of the name of it now, but anyhow, good strip.